Looking for a home remedy for your dog’s bleeding broken nail? Dogs require nail trimmings every now and then. Typically if your dog’s nails are making that click-click noise when walking on the floor, it means that it is time for a nice trimming. Trimming nails in dogs however, requires some knowledge and even some manual dexterity. It’s therefore quite easy to make mistakes and cut a nail too short. When this happens, the dog’ quick starts bleeding and in copious amounts. Here are some ways you can stop your dog’s nail from bleeding at home. If your dog’s nail just broke or you clipped it too short, you will need to take some steps to stop the bleeding. Because a broken nail is very painful, you may need to muzzle your dog just in case. Even the most mellow dogs may bite when in pain. In order to work, you will need to keep your dog calm and quiet for several minutes so that blood clots. So make sure you keep your dog as still as possible by distracting him with treats or a nice massage. After the blood has clotted, it’s important to protect your dog’s nail from being bumped and start bleeding again. You will therefore need to keep the area covered with some gauze as seen in the video below making sure you don’t make it too tight! 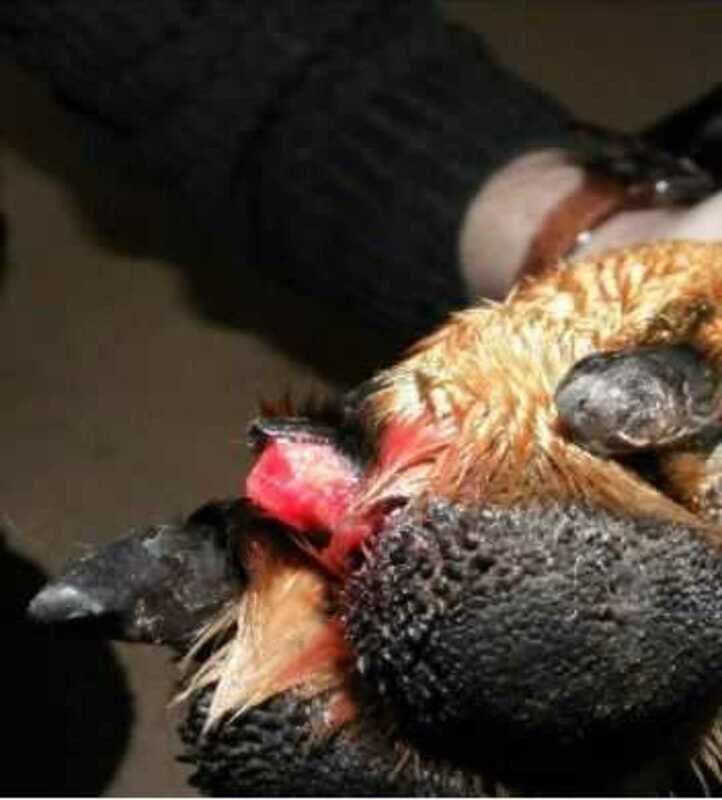 If your dog’s nail is bleeding profusely and doesn’t seem to stop, please see your vet. While most nails stop bleeding eventually, some dogs may have an underlying bleeding disorder that may be preventing their blood to clot, warns veterinarian Dr. Michele P. Obviously, such cases are a medical emergency! To stop your dog’s nail from bleeding, you can pack the nail with flour. Flour will stop the bleeding and absorb the blood. In order to work, you must keep the your dog still for a few minutes so the flour remains in place allowing the blood to clot. If you have no flour, cornstarch may work as well. You can use a bar of soap as an alternative to the flour. You can basically scrape the nail against a soap bar so that it becomes packed with soap. If you do not have any flour or bar of soap handy, you can get some tissue paper and keep pressure against the nail with your hand until the bleeding stops. When you do this, allow enough time for the blood to clot, if you are impatient and check every few seconds, you may dislodge the clot and start the bleeding again. Keep steady pressure for at least 5 minutes. Styptic powder is very helpful to stop the bleeding. Make sure to always keep some on hand in your dog’s first aid kit. There are also special products such as “Quick Stop” sold in pet stores to stop bleeding from over trimmed nails. Keeping the affected leg above the heart level will also decrease the bleeding because of the paw being lifted up it is harder for the blood to climb up. In most cases, the bleeding will stop within 5 to 7 minutes. If there are no signs of the bleeding tapering off, you should contact your vet immediately. Trimming your pet’s nails is much more than a pedicure. Dogs may have trouble walking when their nails get too long and their feet may even appear splayed. In this case, the feet will appear to be slightly or moderately deformed. It’s therefore important that you learn how to trim your dog’s nails correctly. First you will need a nice nail clipper. You can purchase this in a pet store or you may buy one on-line. Pedipaws has had a nice success rate because it makes trimming nails a breeze. Another innovative product is able to detect the quick and tells you up to where to cut. However, we will presume you have the average normal nail clipper. In order to cut a dog or cat’s nails it is of utmost importance that you have good visibility and that you avoid to cut over the quick. The quick is an area that can be seen well under a lamp. If you look at your pet’s nails you will notice that at some point there is a pinkish area showing. This area is the quick, you do not want to cut over this area. Doing so may cause extensive bleeding that may be difficult to stop. In dogs with dark nails the quick won’t be easily detected, so you may need to be a bit more conservative in trimming nails with these dogs. As seen, trimming your dog’s nails is not a big of a deal. If you feel insecure, have your vet show you how. If your dog has dark, blackish nails, it may be challenging to effectively detect the quick. In this case, it is better to be conservative and just cut small tips off. When it comes to taking care of your pet’s nails nothing feels better than a pedicure. Your dog will walk much better and will be less likely to do damage.